The beautiful pearlescent butterfly papers in the Botanical notes collection will add a charming touch to your home décor, try cutting out the butterflies and arranging them in a circle design to create this fab wall piece. The paper pad is a mixture of bright and muted designs, create very different effects like this soft delicate card. Cut a 15x15cm square of blue and white patterned paper, distress the edge. Layer with the UV spot paper cut to 12x13cm and the bird print paper cut to 11x11cm. Wrap a length of lace and satin ribbon around the bottom and add two bows in the same material. Embellish with a few paper flowers. Stamp the Dovecraft birdcage image and cut out the design, mount on foam squares. Glue your design to a 6x6 card blank. There isn’t always a lot of time to make cards so this stunning butterfly card can easily be made in 10 minutes. Try cutting out the butterflies when you have more time, then they will be ready for when you need them in a rush. Trim the striped paper to 12.5 x 17.5cm and layer with the tropical flower paper cut to 10.5x16cm, on top of that layer the pink spot paper cut to 7.5x14cm. 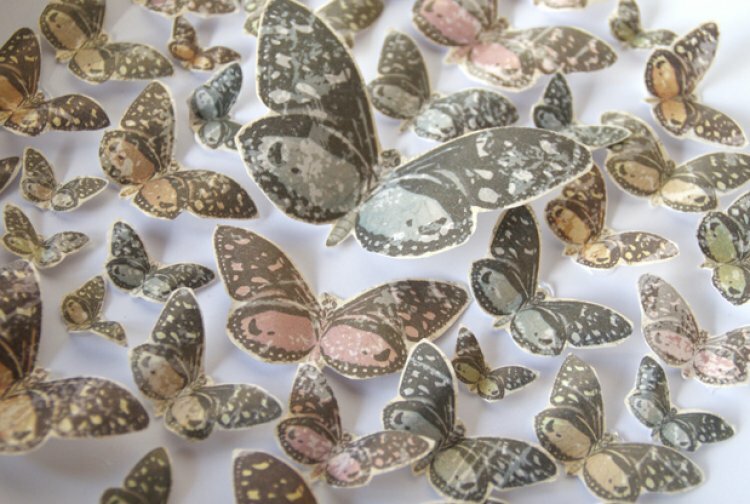 Cut out 4 butterflies ranging from large to small, stick down the middle and embellish with gems and pearls. Bend the wings up to give the card a 3D effect. We love the gorgeous Botanical Notes paper, perfect for a range of craft projects. Share your Botanical Notes papercraft projects with us in the project gallery.